Wireless headphones are undeniably convenient, but the blunt truth is they just can’t come close to the fidelity of wired headphones. Radsone promises to change that perception with its EarStudio, a smaller-than-a-package-of-Tic-Tacs Bluetooth receiver that brings wireless high-resolution streaming and hands-free calling to any wired headphone. Radsone is in the midst of a Kickstarter campaign to bring the EarStudio to market. It achieved its modest $20,000 goal on the third day, and has received nearly $85,000 in pledges as of this writing. 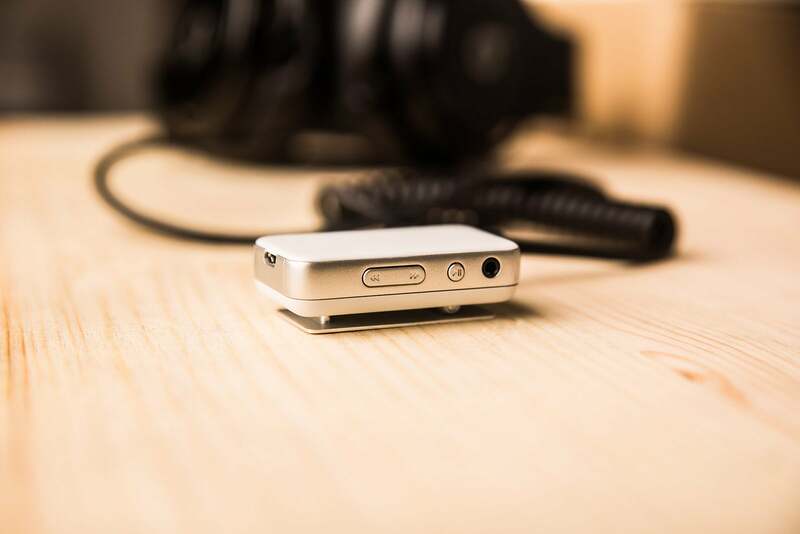 The company expects to ship the EarStudio to its backers in September. As you might know, TechHive typically does not cover crowd-funding campaigns. When we do, it’s because the product met three criteria: Very strong appeal for our audience, the availability of a finished product or an advanced pre-production sample, and the manufacturer’s understanding that we will review the sample as a finished product. The 20mm x 40mm EarStudio will slip into any pocket with ease, but a large clip on its back is designed to fasten the EarStudio to your clothing. The clip’s tension on this pre-production sample was very loose and quickly lost its grip on my shirt or pants pocket. I would expect that Radsone will address this issue when it goes to manufacturing. 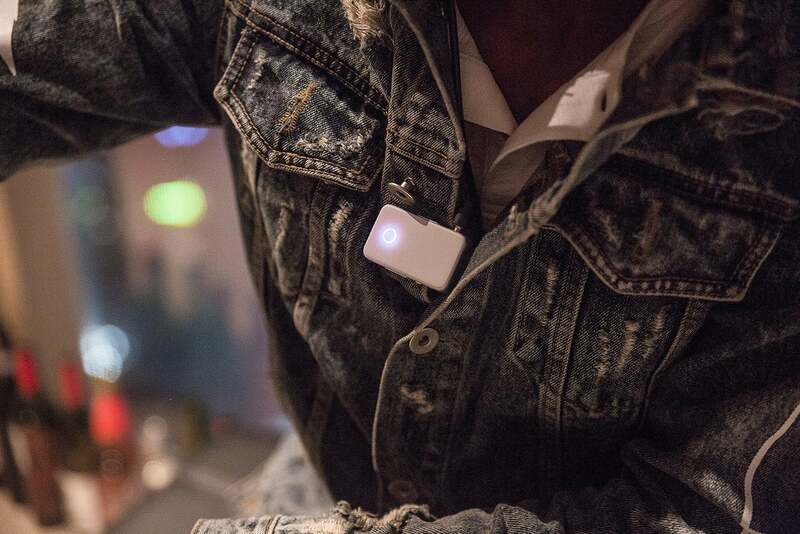 The EarStudio will clip to your clothing. The four sides of Radsone’s EarStudio have all all the control options you might need: There’s power; track-forward; track-reverse; and a 2.5mm fully balanced, double-voltage output on one side. 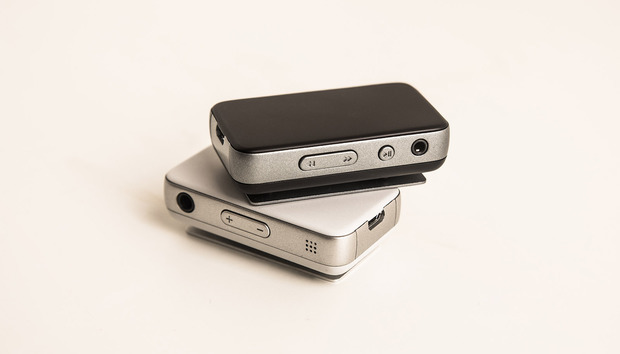 Volume, a 3.5mm double-current output, and a hands free microphone are on the other side. 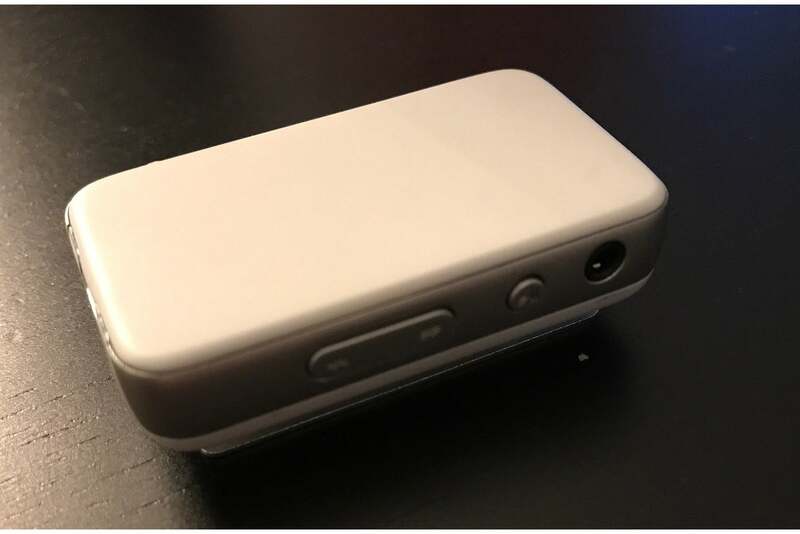 There’s a single micro-USB charging port on the bottom. All the remote control options worked great. I made some calls using the EarStudio as well. People on the other end had no problem hearing me. My only complaint is that the 3.5mm jack sticks out from the side of the unit and sits too close to the volume-up button. 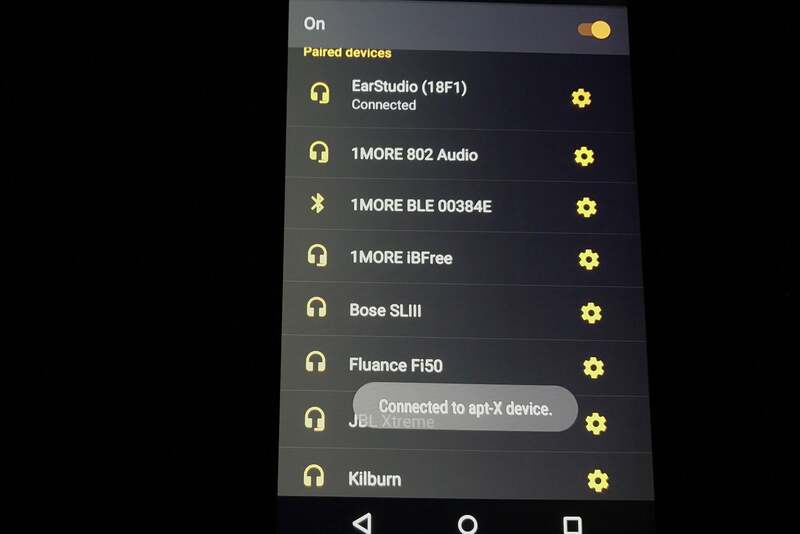 The EarStudio comes with a companion iOS and Android app. 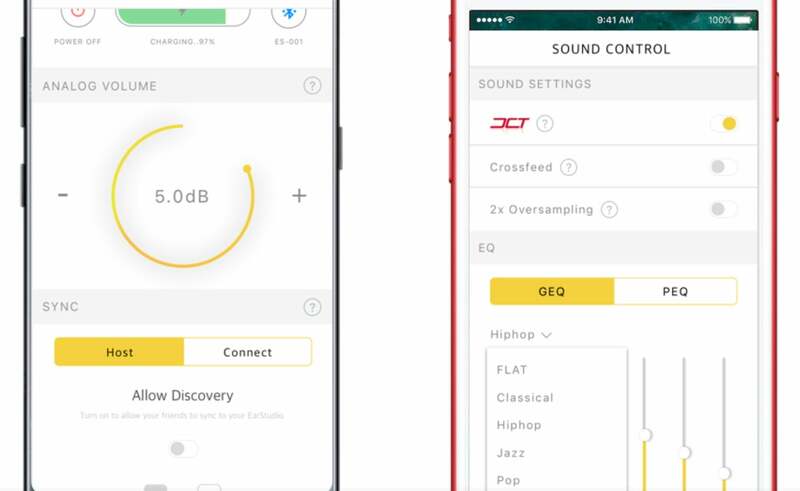 The EarStudio will come with a companion iOS and Andriod app that will allow you to customize the receiver’s sound and EQ settings, but Radsone wasn’t able to provide early access to the app. For such a small unit, it delivers a lot of up time—up to 14 hours of continuous playback life from its 350mAh battery. Radsone didn’t specify the standby battery life, but it should exceed a day or two since I got this easily with the pre-production model. The EarStudio has dual AKM AK4375a DACs built in. This is a 192kHz/32-bit DAC with an integrated Class G headphone amplifier that’s rated to deliver 25mW at 32 ohms and 40mW at 16 ohms, with a signal-to-noise ratio of 110dB. You’ll be hard-pressed to find a mainstream headphone that this little guy won’t be able to drive. Radsone says that the EarStudio has a high-performance DSP (digital signal processor) with a proprietary audio algorithm that’s optimized for Bluetooth streaming, and that incoming 44.1kHz/16-bit and 24-bit PCM (pulse code modulation) signals are upconverted to 88.2kHz/24-bit PCM. As you’ll read below, I was very impressed with the results. You can pair the EarStudio with two Bluetooth devices at once. I paired an iPhone 7 and an Astell&Kern AK70 simultaneously, and I could easily switch between the two, with the EarStudio smart enough to know which task I was performing on each device. For example, I could play music on the iPhone 7 via Bluetooth, then pause the iPhone 7 and immediately play music on the AK70. Playback on the EarStudio was nearly instantaneous, and if I was listening to the AK70 and pressed the iPhone’s button to engage Siri, the AK70 paused and Siri would come through perfectly. A sure selling point of the EarStudio is the fact that it supports Bluetooth streaming with both the aptX and aptX HD codecs. I tested the EarStudio with an iPhone 7 and Pioneer XDP-100R and Astell&Kern AK70 high-res digital audio players. The Astell&Kern AK70 confirmed an aptX HD connection with the EarStudio. Radsone says the EarStudio leverages the company’s patented Distinctive Clear Technology, which suppresses quantization errors in digital audio to deliver more natural sound with greater precision. After reading this little guy’s spec sheet and gaining an understanding of what it’s capable of, I was anxious to give it a spin with some of the high-end headphones in my collection. I had no problems pairing the EarStudio with an iPhone 7, Astell&Kern AK70, and a Pioneer XDP-100R. Unfortunately I had problems with just about everything else. Initially, audio quality was poor. Music sounded veiled and dark, lacking detail. 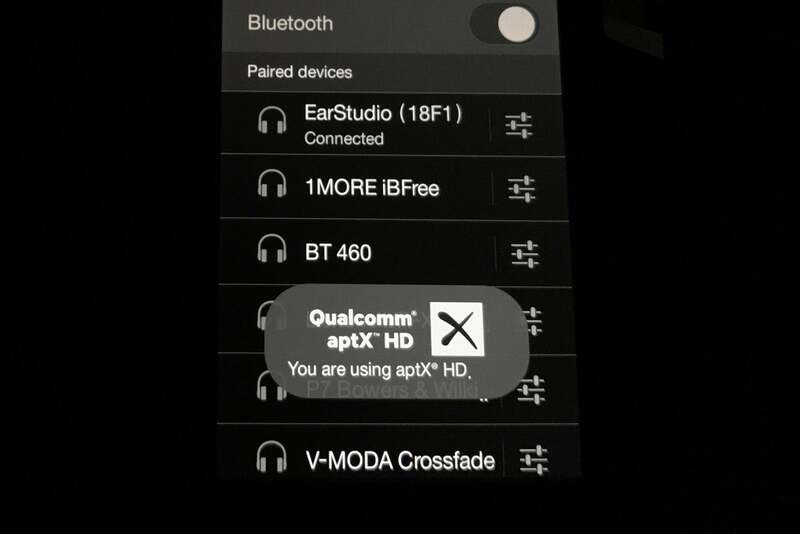 The Pioneer XDP-100R confirmed an aptX HD connection with the EarStudio. Even worse, playing music on the iPhone 7 produced an occasional stutter in the signal. Same held true with the Pioneer. The AK70, however, was a complete nightmare. Drops and audible musical artifacts dominated every listening session. It didn’t matter if I was playing AAC-encoded 16-bit files or 24-bit high-res files. I contacted the team at Radsone about these issues, and they sent me two firmware updates. Bingo! What a difference those firmware updates made—they completely eliminated the problems I had with the iPhone and the Pioneer. They addressed all of the AK70 problems except for one, which I expect Radsone to fix in the final production model. On the AK70, I would still get a drop once in a while if I put my body or a solid object between the EarStudio and the AK70. For example, if I put the EarStudio in my back pocket and moved the EarStudio in front of me, I’d get some interference. Radsone acknowledged this issue and they told me they were going to complete some final RF testing and tweaking over the next 30 days. The new firmware also elevated the EarStudio’s sonic sweetness. When I loaded the second firmware update and hit play I couldn’t believe this was the same unit. The midrange opened up, music had life, dimension, and breath to it. Having played Peter Gabriel’s Live in Athens 1987 from the Bowers & Wilkins Society of Sound music library across all firmware versions, I immediately noted the difference: The live recording had a wonderful sense of space and depth. Gabriel’s vocals were clean and timbrally accurate. My pre-production EarStudio came in white. While I used various headphone makes and models with the EarStudio, I confined my reference listening to an Oppo PM-2, Bowers & Wilkins P9 Signature, and Beyerdynamic Amiron Home. My comments below reflect listening sessions with those headphones. Through the Pioneer DAP, orchestral works, such as the Naxos 24-bit/192kHz high-res recording of Saint Saëns Symphony No. 3 “Organ” maintained their space, depth, and instrument placement along the soundstage. Simply put, I was listening to each headphones’ qualities and signature sound, not the EarStudio’s imposed sonic coloration. What thoroughly impressed me about the EarStudio is how close wireless and wired performance was. Usually, wireless headphones sound very different between their wired and wireless modes. Playing any superbly recorded hi-res song by Chesky Records including Rebecca Pidgeon’s “Spanish Harlem,” Alexis Cole’s “Dazzling Blue,” or City of the Sun’s “Everything” on the AK70 with aptX HD underscored the great potential that lies with the EarStudio. Generally speaking, you’d be hard-pressed to tell the difference between the two modes. The EarStudio is compatible with any headphones with a 3.5mm jack or balanced headphones with a 2.5mm jack. There was superb top-end extension, midrange clarity, and bottom-end response. Never in my wildest dreams did I think that I’d be able to get about 90-percent of the performance of high performance headphones in a wireless package. The biggest shortcoming between wired and wireless high-res playback, in my opinion, was midbass and bottom-end performance. Midbass and bass always sounded better, cleaner, and resolved more microdynamics when plugged in. Playing tracks like “Underground Army” or “The Fire Rises” from the 24-bit/192kHz version of the Dark Knight soundtrack made the differences immediately. However, on material such the DSD version of Pink Floyd’s “Wish You Were Here,” the differences were more subtle and harder to make out. I confess, when I first received this tiny, lightweight pre-production sample of the EarStudio, I didn’t think much of it. And, when I had the maddening issues initially, my editor and I had agreed to send the EarStudio back to Radsone. Boy, am I glad I didn’t. If you’ve made an investment in really good-sounding headphones and wondered when someone would invent a gadget to magically transform them into a wireless pair, then your wait is over. That day has arrived. I’m genuinely floored with how good the EarStudio sounded—especially when paired with high end headphones. For the first time, I didn’t need to endure significant sonic compromises when I wanted wireless freedom. At the end of the day, the EarStudio won’t completely cut the cord; but it will bring wireless freedom and hands-free calling to any headphones. And to do all this for an introductory price (for Kickstarter backers) of $50? That makes the EarStudio go from audio accessory to audio essential. Highly recommended.